With four sets of tees, Golfers of all abilities will be able to play from a distance that suits their game. 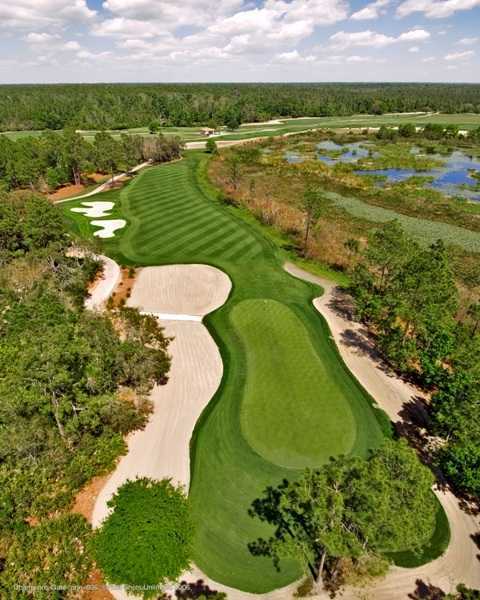 The Par 72 ChampionsGate National Golf Course measures 7,128 yards from the black tees, with a rating of 75.1 and a slope of 133. The remaining pin placements are: blue - 6427/126 slope, white - 5937 /124, and gold - 5150/111. The National Course features gently sweeping fairways, 80 sculpted bunkers, greens maintained in tour condition, clever doglegs and scenic water hazards. Water comes into play on many holes, but few forced carries means this layout can be maneuvered by all levels of players. The sharply framed golf holes end up on smaller greens, making course a shot maker's delight.